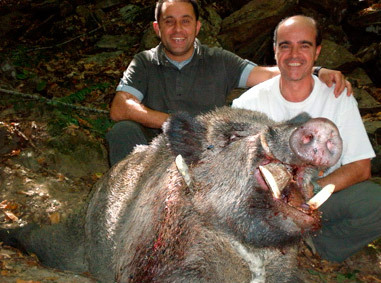 You can find wild pigs from the Iberian Peninsula to Fareast. 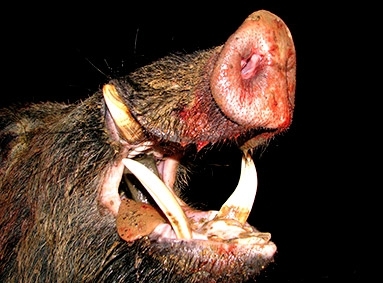 There are 17 subspecies with the biggest subspecies being the Usuri Wild Boar living in the far east. Live weights of more them 350 kg aren’t unusual. While in most places of if the world the population of wild boars is rising, it is can be very difficult to find big trophy tuskers. In Turkey 95% of the local population are Muslim which naturally means the the wild pig is uninteresting for the locals and is the reason why the population is so high. 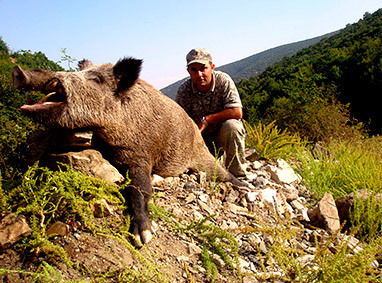 In the mountains these wild boar can grow and mature to amazing sizes because nobody is hunting them and this is the reason why our clients are able to go home with trophies up to 29 cm in high class. 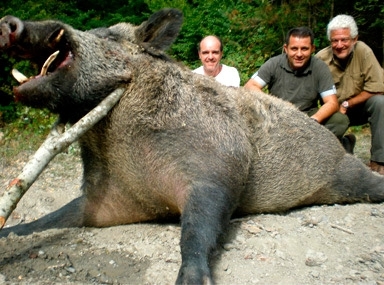 High population of mature boars. All types of rheumatic sicknesses. Kidney & urinary passage problems. And not to forget the daily stresses all of us are confronted with. 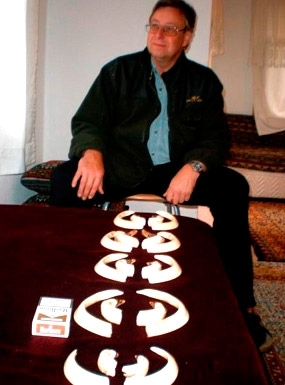 The spring hunt is a fascinating hunt. Rising temperatures and spring nature is a beautiful base for a successful hunt. Many of our clients are repeat hunters especially during spring time. This makes early reservations very important. With a bit of luck along with some good weather and good shooting, it is possible to take between three and five trophy boars in five nights easily. The short and warm nights in summer time are ideal for successful summer hunting. 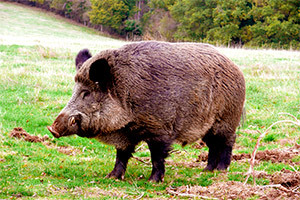 The boars can’t find enough to eat on the fields (May – June) and they prefer the easy food we supply with our baits. In high summer (July – September) there are enough things for the boars to find in nature but water becomes a big problem. By knowing the location of their preferred water sources , combined with baiting means a 100% success. 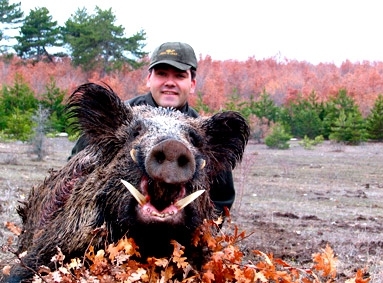 High summer is also the best time to combine a wild boar hunt with a family holiday. Turkey is a famous holiday destination and your family will have plenty to do while you go hunting. 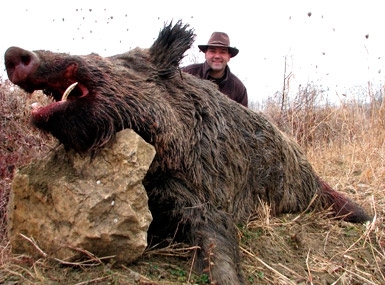 The single hunt for wild boar gets organized during the full moon period. The hunt starts normally with a waiting on the bait. Because the hunting guides do prepare the hunt in advance, they know exactly where the big ‘tuskers’ are. We don’t use high seats in order to be flexible on wind direction. The stalking hunt during the night is very exciting! As the guides know more or less the time when the boars are on the bait they wait with you up to that time. After that you start stalking. Shooting distances on the bait are between 50 and 120m. During stalking, shots up to 150 m are normal. Important for a successful night hunt is a good set of binocular with 56 mm objectives and a rifle scope with 56 mm objectives. Your clothes should be very silent. Fleece jackets are a good option. Hunting is generally very easy as it takes place at the forest field line area. The guides are using modern night vision equipment and it is possible for them to find the boars also on dark nights. Calibres over .30-06 Springfield are ideal for the hunt. Experience shows us that a 375 H&H is a good calibre combined with a 300 grain bullet. Under normal weather conditions you will get enough chances to fly home with three or more trophy boars. We take around five hunters in one group to ensure the best service available. 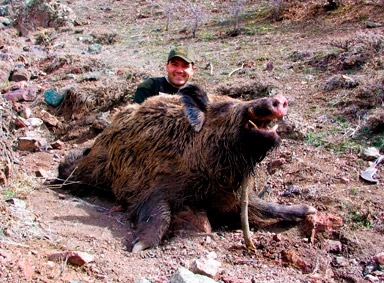 The fee for a missed shot looks a bit high but preparing the hunt and feeding one special boar takes about three weeks of time in advance. Staff, cars, fuel and food has to be paid for and if you miss a boar it is lost for the next few months. Please avoid shots on not broad sight standing boars. This will make hunt easier and more successful. There is breakfast and late lunch included in our program. If you want to eat something after the hunt it will attract an added charge. Please check the beverage prices upon arrival. We suggest paying the drinks immediately the same evening. If you invite your guide for a drink you have to pay for it! We are in permanent contact with the local people and we know exactly where the big boars are. 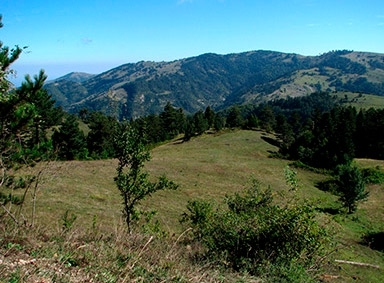 Our main hunting areas are in Tokat and in the black sea region. Airport and custom clearance is at Samsun. Our combination hunt “summer & sun & tuskers” takes part in the south of Turkey. Airport is Dalaman, a well known destination for summer holidays. Day 1: Arrival and transfers. Day 2 to 6: Day hunt and holidays. Day 7: Transfers to airport and departure.